It all started with an off-hand comment to a friend who had just returned from France. “I’m looking for something fun and out of the ordinary to do while we’re in Paris,” I told my friend. Her eyes immediately lit up and she sighed, “You HAVE to do the biking trip through Versailles – it was so much fun!” Versailles! Just the mention of the name conjured up images in my mind’s eye – a glittering palace, powerful kings, priceless treasures. Arguably the most famous palace in Europe, Versailles was a lavish symbol of the authority of the French crown in an era when France was the epitome of culture, wealth and influence. And, its renowned gardens are so vast that no visitor can see them all in one day – unless, that is, they are on a bicycle! Taking my friend’s word for it, I booked our Fat Tire Bike Tour to Versailles. Our excursion started early on a Sunday morning at the Fat Tire Bike Tours office in Paris, located literally in the shadow of the Eiffel Tower. We selected our beach cruisers for the day, and off we went with a small group of fun loving people, thirsting for adventure. We rode through the classy boulevards of Paris, gliding in and out of traffic like locals, to the nearest RER train station. As we arrived at the train station, I was a little worried. “What am I supposed to with this bike when it’s time to get on the train?” I inquired. “It can be tricky”, our guide warned us. “So whatever you do, don’t hesitate! 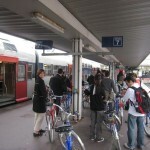 The stop is short, but when those train doors open, move as fast as you can with your bike and don’t give up until you’ve boarded that train.” The moment of truth came, and yes, it was a bit chaotic – hilarious actually, as 15 people simultaneously rushed to board the train with bikes in tow. But we did it, and soon we were on our way for the 20 minute trip to the little town of Versailles. We found Versailles to be a wholesome looking village with streets washed fresh by an early morning rain. We rode through farmland and past country homes, marveling that someplace this rural could be so close to one of the most glamorous cities in the world. 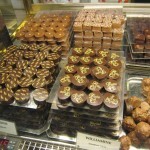 Our guide led us to the center of town to the Versailles Market, known as Place du marché. Believe me when I tell you that this is definitely the most amazing outdoor market I have ever seen in all my travels! 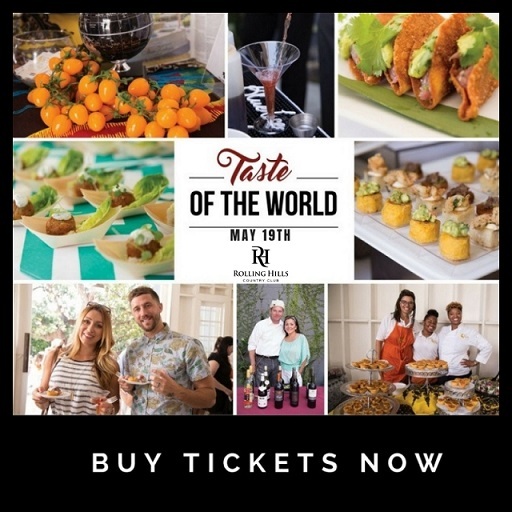 This place is a virtual cornucopia of delights, a fantasyland for foodies, the mother of all outdoor markets…you get the picture. 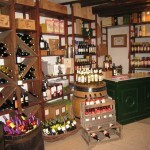 It was absolutely overwhelming in its expanse and charm but we had a mission – we needed to shop for our picnic lunch! We had a little over an hour to visit the market, which began in the open air of the town square and then spread out into more little stores down narrow alleyways and side streets. There were delectable pastry shops, meat markets, stalls with every imaginable kind of exotic cheese, aromatic fruits, fresh vegetables, wine boutiques, bakeries, and buckets of riotous colored fresh flowers everywhere. Amid the cacophony of the market, vendors shouted good naturedly, and the local townspeople chatted and gossiped as they bought and sold their wares. Reveling in the bounty of it all, we bought baguettes hot from the oven, the creamiest Brie, a slab of goat cheese, thinly sliced roast beef, a rich and savory foie gras, ruby red cherries and grapes that tasted like perfume. 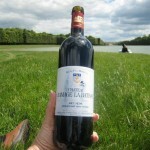 Add a bottle of Chateau Ramage la Batisse Haut-Médoc, and voila…we were ready for our picnic! With our treasures stuffed into our backpacks, we were really in our element. We laughed at the sight of Gary with two big baguettes sticking out the top of his – merveilleux! 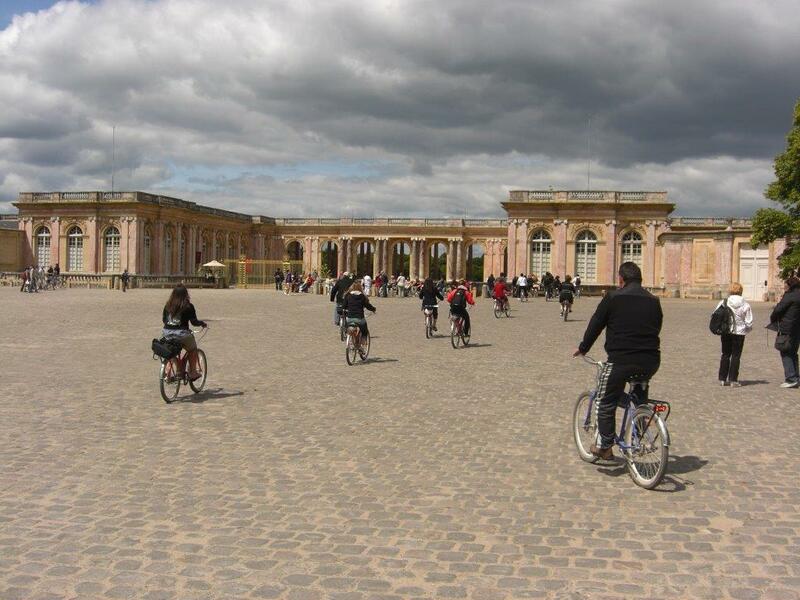 Back on our bikes, we rode up a short hill onto the grounds of the beautiful Château de Versailles. Once on the grounds of the Palace, we pedaled our way through history, stopping every now and then for our guide to share interesting and informative stories of the places we were seeing. We cycled right up to the Grand Trianon, a grand-looking castle of pink marble. Meant to be a miniature version of the larger Palace, its size was still imposing. Here, Louis XIV retreated with his mistress and other invited guests to escape the pomp and rigid formality of court life. Nearby was The Petit Trianon, a much smaller chateau in the same park. Built by Louis XV for his mistress Madame de Pompadour, it later became Marie Antoinette’s favorite place to relax and escape the strict etiquette and formal demands of the Court of Versailles. We also stopped at Marie Antoinette’s Hamlet, where the queen spent her happiest days, contentedly enjoying the charms of country life as she played at tending her sheep and ducks in a setting which emulated her girlhood home. I was astounded at the massive size of the carefully tended grounds of the royal palace, which cover over 2,000 acres. We cruised leisurely through this sunny playground of the kings, taking in the spacious tree lined gardens, the wind blowing in our faces and nothing but the sound of our tires crunching over the gravel pathways. After awhile, we stopped at the impressive Grand Canal. This long and shimmering body of water is located at the end of a promenade leading from the Palace. A huge reservoir and the playground of kings, the Grand Canal is a source of ever changing light. Here, kings took part in all kinds of nautical spectacles. Royalty floated up and down in imported Venetian gondolas or sailed row boats and even small-scale models of larger ships. Elaborate firework displays on the terrace of the Palace were designed to reflect on the Grand Canal, and to this day firework spectaculars take place on summer evenings. In the winter, the royal family and their guests cavorted over the frozen water on ice skates and sleighs. Alongside this spectacular site, we reclined in the grassy fields for our picnic. The spring sunshine was soft and the breeze was brisk as we enjoyed the golden light reflecting across the Grand Canal. With the majestic Palace in clear view at the end of the Grand Canal, it was an idyllic and somewhat surreal setting. Let the picnic begin! We had made fast friends with the others in our group, and before we knew it, we were all sampling each others’ delicacies. It was a feast for all – truly, the Ultimate Picnic. There was more riding to do after lunch (a good thing, considering I had just eaten about a pound of Brie all by myself.) 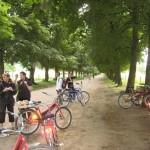 We rode through forested pathways to the spectacular Chateau de Versailles and parked our bikes. Joining throngs of other people, we entered the Palace, returning in spirit to the time period of the most famous French kings and queens. 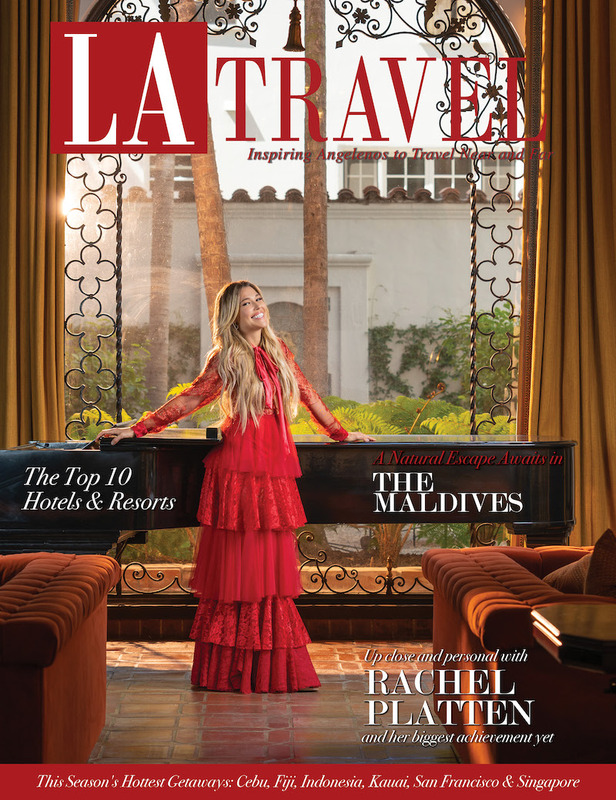 From our first peek inside, our eyes were popping at the extravagance and affluence of it all. 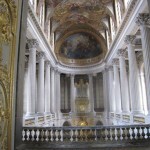 We visited the double tiered Royal Chapel with its magnificent marble inlay flooring, then the famous Hall of Mirrors. A stunning receiving room of the royals in its day, the Hall of Mirrors is as spectacular today as it was in its prime. Three hundred and fifty-seven mirrors, luxury objects at the time, graced the hall, reflecting the beauty of the gardens through windows on the opposite wall. From its painted ceiling to its gold-leafed embellishments, priceless paintings and crystal chandeliers, the Hall of Mirrors is a mesmerizing and awe-inspiring display of opulence. I imagined what it was like to be here in the days of the French kings, but also in more recent times, when in 1919 the Treaty of Versailles was signed here, officially ending World War I. On we went, through the Royal Apartments where we viewed the lavish King’s Bedchamber, re-situated there by King Louis XIV, the Sun King, so that his room would face the rising sun. We arrived next at the exquisite Queen’s Apartments featuring the Queen’s Bedchamber. Occupied by several queens, I’m sure the walls of this room could tell some remarkable tales! Marie Antoinette was the last to sleep here, and we could see the little door in the corner through which she fled, unsuccessfully attempting to escape the French Revolution’s mobs which stormed the palace in 1789. As the day waned, we wandered on through room after room of magnificent apartments, suites, drawing rooms, dining rooms, galleries and salons. We ended our visit enjoying the various fountains of the gardens, each one a work of art in itself. 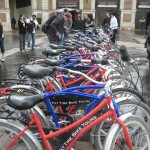 On sensory overload, we mounted our bikes for the return trip to Paris. At the end of the day my derriere was a little sore but we’d made so many memories I didn’t mind. 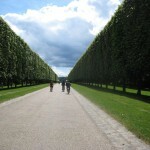 Our biking experience through Versailles was an adventure fit for a king!